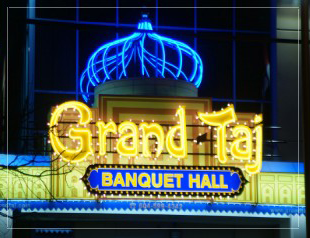 The Grand Taj Banquet hall provides wide range of services that cater to any special occasion. We offer complete packages as well as individualized services to suit any occasion. Our banquet hall and ballroom are available to use 7 days a week, 365 days a year. Please call ahead to check for availability of our facilities as they are usually booked first-come, first-serve basis. We offers experienced personal consultants to help make your occasion special and memorable. We can help you manage the extra details such as ordering invitations, cakes, transportation, photographer, D.J. and other services you may need. In addition to providing in-house full service catering, we also brings our services to your facilities.